There is an Oliver Mtukudzi. He was in the media and was celebrated immensely when he passed on last week in all forms of mass communication. He read like a saint. In other insinuations he read like a sinner. One would wonder who was Oliver Mtukudzi really. Yet Tuku would be interpreted to mean different things to different people no doubt. I knew an Oliver; an Oliver I was privileged to know and appreciate as a person and personality. What was celebrated in most instances was Tuku the personality. Yet some aspects of the person, the real Oliver, may run contrary to the personality many knew and loved. And when I was asked to be the Master of Ceremonies at his funeral both in Knowe, Norton, and the gathering in Madziwa, it was a privilege to bid mukoma farewell like that. Farewell to Tuku the person. It is that person; complete with human traits, that I want to shed light on, if only just a bit. Many went on and on about Tuku being humble. They were perhaps right about the personality that Tuku was. Because deep inside, Tuku was anything but humble. In fact, Tuku could be a hot bowl of soup to be honest. It is because of another trait of his as a stern and strict disciplinarian. Tuku was intolerant of any lack of decorum and human grounding. “Robert, munhu ita kunge anebva kune vanhu,” he told me once after a nasty incident. (A person should behave like someone who comes from amongst people that give them wise counsel). An overzealous fan had just rushed to Tuku as he was affectionately known, turned round and attempted to take a ‘‘selfie’’. “Who are you?” Tuku lashed out. “Where you come from do you just run up to people and not introduce yourself but just start taking pictures? Were you never educated on good social morals?” he asked the now embarrassed inebriated chap. In fact, Tuku was the perfect antidote for a hangover. As he was telling off the wayward fellow, all the alcohol in his system seemed to leave his system, as he sobered up to a tongue lashing on hunhu, Ubuntu, from Tuku. That’s is the Tuku a lot of people who worked closely with him knew. There is a street lingo term; dzungu. Acting rashly without enough consideration for the situation at hand. Mukoma Tuku was a person who hated dzungu and would admonish you when you acted as such. One day I was in Mutoko and he gave me a call asking where I was. “Mutoko,” I said. “Come and see me tomorrow in Norton,” he replied. Who could not say no when Tuku summoned. And so it was that I was in Norton on the morrow. I went into the studio where he was working on the video to the musical “Masanga Bodo”. As I walked in, many people working on the project who wondered who I was looked at me with grey ashen faces. Who was this moron who had the nerve to walk into the office when Tuku was working? He had no tolerance for people who disrupted work. I know as much and got in and sat down. He turned round and looked at me. His face was grey and deceased. No emotion. As if he were looking at an unimpressive stone carving, before he turned back to the work and continued. I sat still and for close to 30 minutes the people in his company were wondering about two issues. Who was I and why had Tuku not asked me to leave and let me stay as he worked on an intimate private project. I stood up, gave my input and immediately he said; “Indeed! That is the touch I was looking for. That’s what was lacking!” and then he said hello to me with a warm smile and tonnes of love before asking how my journey was. He topped it up with our traditional greeting. Makedekede from Mutoko. The greeting culture of our women who shake hands at least twice while punctuating every move with a single clap of the hands. We were like old school mates. Had I not known Tuku and assumed that just because I had been asked to visit I could just rush in and say hello, I would have been given a verbal lashing and a cold shower. Yet I knew he always wanted one to ‘‘chill’’. Never be too familiar. Like the queen of England, I didn’t speak to Tuku upon meeting him until Tuku spoke to me. A true traditionalist. At the end of that day he took me out for a meal of sadza remhunga (finger millet meal) and traditional offals with Ibbo Mandaza and Sam Mataure. Cracking jokes along the way in his iconic ‘‘Tuku’’ personalised number-plated Land Rover, drawing glances from other motorists. “Vari kundinangara. Kabanga varikuti ndini Tuku,” he joked. (They are staring at me. Perhaps they think I am Oliver Mtukudzi). Perhaps he wasn’t joking. Because as it seems today there was a difference between Tuku the performer and Tuku the person! That is why when friends from far and wide asked me to introduce them to Tuku for business I would make endless calls to reach him personally and ask him for an audience. “We thought they say you can pitch up anytime and he will give you an audience?” they would ask baffled. Indeed I could. But knowing Tuku better, I preferred the orderly route than the seemingly nepotistic and spur of the moment route. Fine. He would never give me the hairdryer treatment. But I never wanted to find out whether I was a possible candidate! One day at a show he asked after my parents. “They are fine and in the rural areas,” I told him. “We should go and visit them sometime,” he said. Nice joke I thought. “Yes” I said. That Sunday morning, drunk as a skunk in a dirty little bachelor flat I woke up to his call. “Robert, its me. I am at your gate,” he said while at the infamous Jorosa Court. Needless to say that was the beginning of a three-day trip to Dande, Muzarabani, where he cracked jokes and educated one sekuru Nick and I on the wisdom behind his music. I was drinking like a sperm whale. He was eating like a field mouse. “I have diabetes that is why I need to eat regularly. Why do you need to drink that much,” he asked. I didn’t have a doctor’s prescription to hide behind and looked stupid when he asked. He rescued me; “You will grow out of it. I used to drink like you and even smoked but I grew out of it.” I was comforted. And continued drinking! On our way back he had another joke. At Mt Darwin someone asked him if the young man with him was Sam. It was in fact me. Not to worry for the mistake he assured me; “Vanhu vakangoona vanhu vasvipasvipa vanongoti peno ndiye Sam wacho!” (People just see us as spectacularly dark and assume you’re my son Sam!) Indeed we were very dark berries. He was proud of it, his dark rich complexion. A mark of identity it was for him. And yes he could be humble. One day he called saying he had a new album he was about to release and wanted me as a journalist to give it honest criticism. No holds barred. I wanted to rush and collect it from him. It was an honour. “No,” he said. Then in a slick Jeep he delivered it with wife Daisy by his side. Yet today many small artistes with minuscule careers play god and feel so special they don’t pitch for interviews. They think super highly of their works. They, as Josh Hozheri said, travel with bodyguards and play deities. Yet the ultimate super star knocked on the doors of small human mortals asking for opinions. Yet Tuku was weak and vulnerable and that is where his humanness came through. I was the first person to go and collect him at the airport when his son Sam died. He had been told that Sam had been in an accident so as to make his return from South Africa with his wife Daisy tolerable. Unfortunately, someone had passed condolences in the arrivals area at Customs, alerting the two of their tragic loss. I was allowed into the international airspace after being cleared and walked towards him at the carousel. Daisy was inconsolable and wailing. She had lost her golden rose. Tuku turned and saw me at the luggage carousel as he waited for his baggage. He walked over to me. Hobbling like the weight of the world was on his soul. Embracing me and laying his head on my shoulder he said “Sha Robert, hanzi mwana wangu hakusisina.” (My friend Robert, they say my son is no more). What do you do when a god of music, a larger than life character like Tuku puts his head on your weak, young, mortal shoulders and seeks solace and comfort from you in his most deepest darkest tragedy? His tall frame and shoulder bones digging into my torso as he wept uncontrollably into my breast. His tears seeping into my T-shirt. Perhaps I should have said ‘‘nyararai henyu samanyanga inga ndimi mhukahuru wani?,” as he suggests in his song? Yet perhaps my silence was what he required and my shoulder was the strength he needed. In that silent weep I could hear his heart breaking beneath his ribs. With a grit and coarseness sharper than his voice which emitted a sound like broken glass. He may have walked this earth after that day. Yet the day Sam died. The day he cried on my shoulder. The day I went with him to the mortuary and saw Sam lying like a beautiful dark inanimate work of art on the mortuary tray. That day when Oliver whispered a song in Sam’s ear that I could not hear; a song meant for the deceased closed ears of Sam alone. That day when Daisy said to the corpse of Sam; “Sam, chimuka ndimhamha. Sam Ndauya. Sam chimuka kani hazvichanakidza!” (Sam wake up now. I am here now Sam. Sam wake up now you joke has ceased to be funny). That day when Tuku held my hand. Held the hand of Patson ‘‘Chipaz’’ Chimbodza. Of Josh Hozheri as we went to collect the burial order for Sam Mtukudzi. 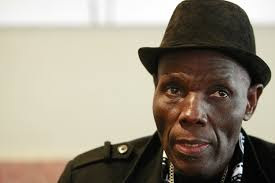 That is the day when Oliver Mtukudzi truly died. His mortal body stayed behind only to be buried last Sunday. It was feigning life. Yet the legend and all he celebrated and loved had died when Sam died. Last week. Amidst the multitudes in Madziwa, was just a belated burial of a man who had long since closed the chapter of his life on earth. Yes. Oliver was a music colossus and larger than life performer. Yet to those who he often opened up to, he was a father, a brother a friend and husband. He could bleed and feel anything more than a needle. He was not a saint. Nor was he a particularly fantastic sinner. He was a height of flesh and blood like you. And me. Yet unlike us, he had an incredible talent to touch the lives of many. His voice interacted with the hearts and souls of many people. Living. Dead. And undead. And his voice will bid counsel to the souls of those yet to be born. Like the Bible, or the words of the divine poets, he was a prophet of our time and beyond.